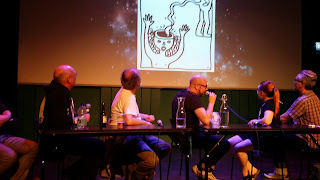 I was thrilled when Carolina Gomez Lagerlöf announced that they were doing Fantastika at Dieselverkstaden again. I never attended Fantastika in 2013. I would have loved to, but due to circumstances, I couldn't. 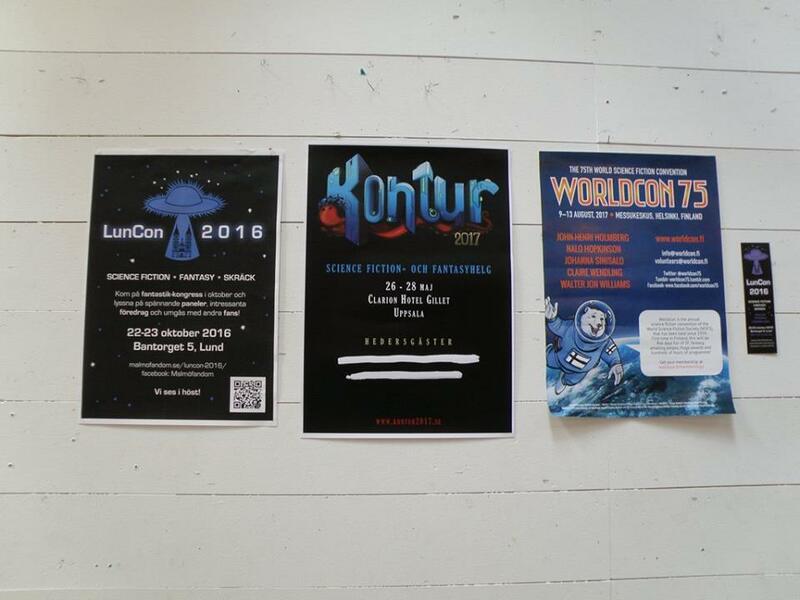 This time, I was there working for three different conventions; LunCon 2016 that I'm hosting this fall, Kontur which I'm on the concom for next May, and the big Worldcon 75 which I'm on staff for. You're probably wondering if I'm mad, doing all of these constuff at the same time. The answer is yes. I packed all my flyers, con-t-shirts and went. Join us, and together we shall rule fandom as readers and fans! I met up with my Finnish friends at the Central Station in Stockholm and went out for lunch at the lovely Rice-restaurant near Dramaten. I ate all the watermelons. And the sushi. And ice cream with salt licorice. So good! 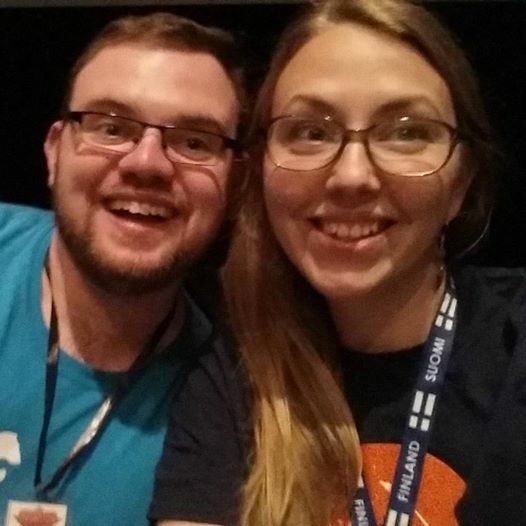 I met a new Finnish fan, Linn Gröndahl, and we bonded on the bus over our disabilities. She was a cool and awesome person! Then we went to Dieselverkstaden. My first thought was that it was a really nice and big venue, suited for all purposes. Throughout the weekend, though, I started noticing stuff I felt was a bit off, like the Dealer's room was a bit hidden, the accustics were horrible (concrete walls are not good for large gatherings!) and the Bistro was horribly noisy. 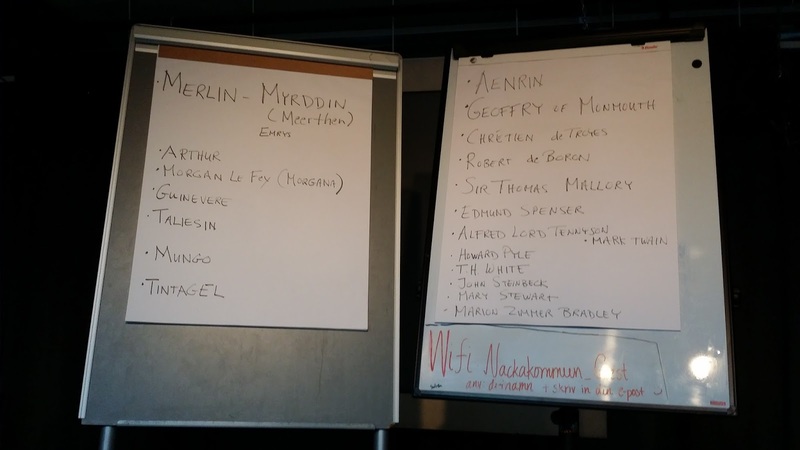 First item was Merlin, the man, the myth, the magic wih Rhuddem Gwelin. An excellent talk about the different versions of the myth and how it changed by christianity. Morgana became an evil sorceress, Guinevere became an adulteress and Nimue became evil. I really loved the talk, and it was fascinating to hear how the story changed with the different times. I loved that Rhuddem was so much in love with Colin Morgan (I am too!). This talk could easily have been in a bigger room, as it was filled to the brim. 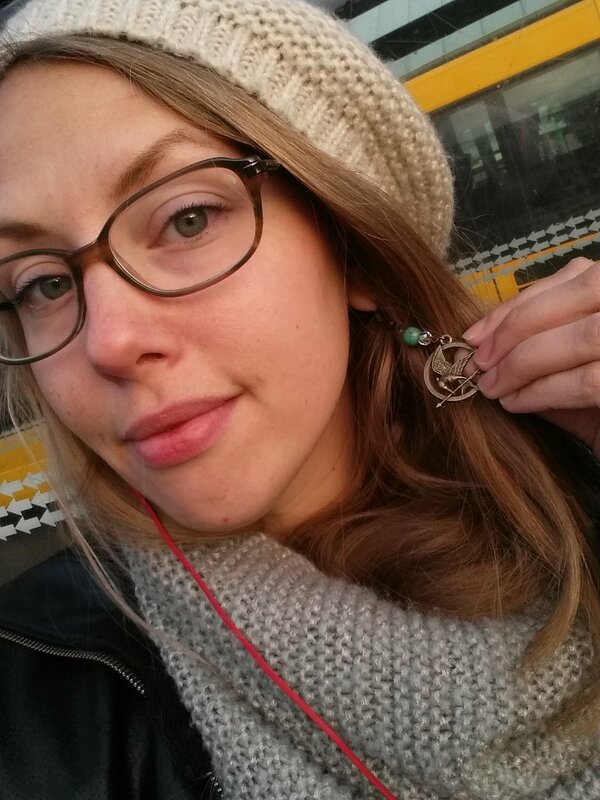 Then, I met the lovely Therese Norén who'd emailed me the week before; "Hey, I have a gift for you. Remind me to give it to you at Fantastika." I'd been like: "GIFT? What gift? Am I getting a gift? I wonder what it is? Probably dillchips? Can't you tell me? Giiift! Tell me now? I wanna now! GIFT!" And she was like: "It's a gift." It turned out to be A WHOLE BOX OF SUPERNATURAL. I almost cried. Then Eva Norman told me that they had made sure the Gopher Hole had dillcrisps. And incidently, Luke Smith also informed me that he had bought and eated dillcrisps. I congratulated Luke, and congratulated myself since the dillcrisp-fenomenon is becoming rather large in Sverifandom. Maria Turtschaninoff's Guest of Honour interview with my friend Nahal Ghanbari was another good item. Maria is truly a gifted writer with such creativity and love for stories! Later on, I had my first own item; The open mic from 21 until 22. Unfortunaly, we had almost noone in the audience. I went to the sofa groups outside and asked a few members to come and listen, which they obligedly did. Most of the other members of the con were at the panel about the big Fannish Feud around Feminac. I would have loved to gone to, too! 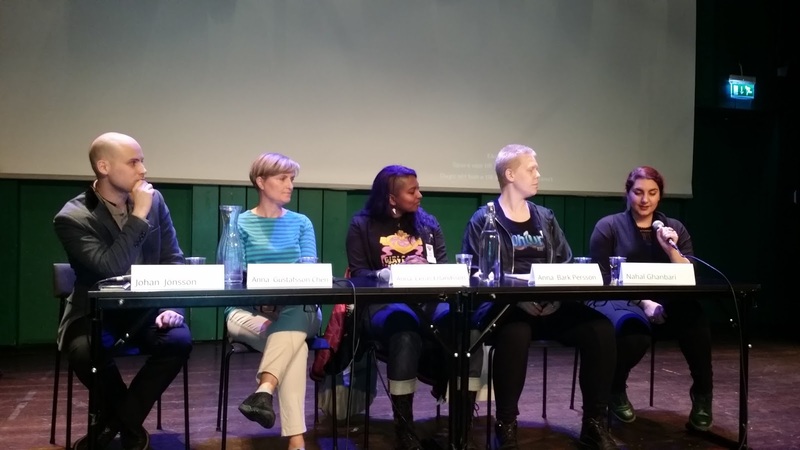 I was actually told by Lena Jonsson, one of the participants in the panel, that they had created the panel mostly because of my suggesion, so it was a shame I wasn't able to go. I was a bit disappointed, honestly. 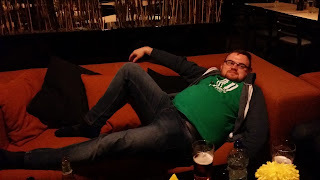 The thing about Swecon is that I love it. I want to see it all. I want to talk to everyone. Be everywhere. Tobias Jarl impressed me with his skill of associating pics with movies. This picture above was from the movie poster to the Exorcist. Noone but Tobias got that. Later, Ian Sales won the respect and awe of Finnish Fandom by scoring high on the fourfield-questions that were quite impossible. (Although I got the Jukka-thing!) Ian Sales is an excellent guy! After the programs ended, people seemed to wander of somewhere and I went to bed early. At two o'clock in the morning Nahal and Anna stumbled in. I sad up, very confused, and tried to understand what was going on. Anna tried to explain repeatedly but I sounded like a deaf and confused grandmother. "T-shirt? What are you doing? Where are you going? What are you doing? What t-shirt? What are you saying?" Then I put the hearing aids on. The next morning, I became increasingly suspicious that the program-team had a grudge against me when my next program item "First time at an SF-convention?" had almost no audience either. This time I went to the Dealers room and got Swedish Zombie-Jonny and his friends to listen. Later Jonny came up and said to me and Eva that he really appreciated the presentation, which made me really glad. 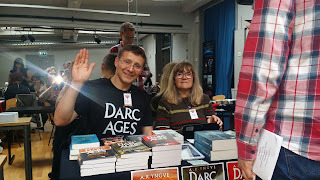 And at the dead dog party on Sunday I talked to Jörgen Jörälv who'd been to my item at Confuse. I was told he really appreciated it, and the bingo was great too, so that made me happy again. Have to do that bingo again! I sat a while in the dealer's room on saturday, talking to people about Worldcon, Luncon and Kontur. And Älvsbyn. But the dealer' room had bad air and the accustics were really bad, so I had to leave early. I went to the hotel room, had a shower and that picked me up a bit. Though, as I was drying my hair I almost had a heart attack because Johan Jönsson walked in on me. (He'd gotten the key from Anna to get her USB-stick before a panel). Luckily I was wearing a towel. 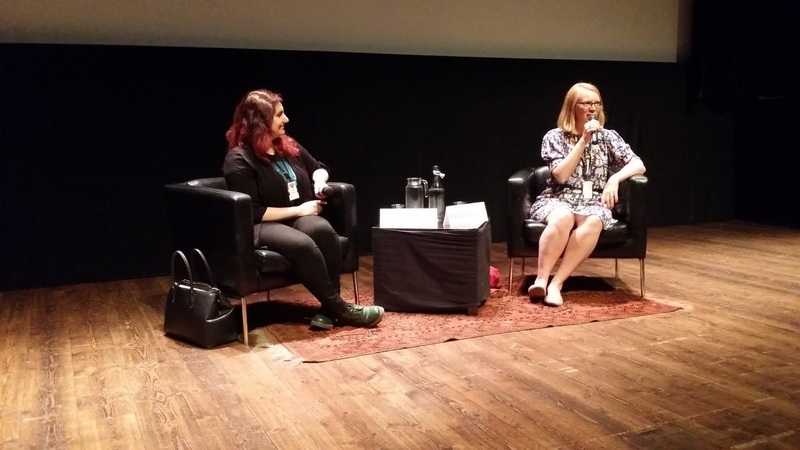 Anna Bark Persson and Anna Gustafsson Chen where also in the panel, which should have been named Nahal and the Annas with the double surnames. After that I felt a bit over-tired and went to talk to a lot of friends at the restaurant Bistro. We sang silly songs and talked about fandom. Tobias Jarl and a few others where being intellectual. Me and Hanna Hakkarainen just showed each other pics of cute cats and babies. Then my brain just stopped working, I started to lose words and couldn't concentrate, so I went outside for fresh air. I found a spot under the hut on the other side of the road, so I sat there and was joined by Adam Thorp for a while. I started noticing more and more how my tired brain got worse as the weekend progressed, I had headaches, got tired quickly and couldn't focus, couldn't join the conversations. It probably was due to the fact that the venue had concrete walls and the sound was too noisy for my poor ears. I'm afraid I became quite boring at times. Because of that tiredness I missed Nordic Fantasy AND Feminist SF in the 70s and today. Such a bummer! The big thing me and my Kontur-committée friends have been waiting for happened later that evening: The vote for next Swecon! 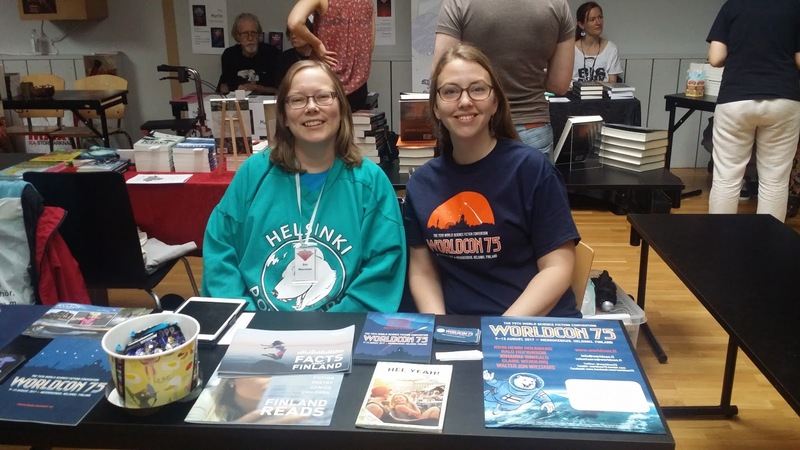 We had secured four Guests of Honour already, Ann Leckie, Kameron Hurley, Saladin Ahmed and Siri Pettersen, and we couldn't wait to tell people about them. 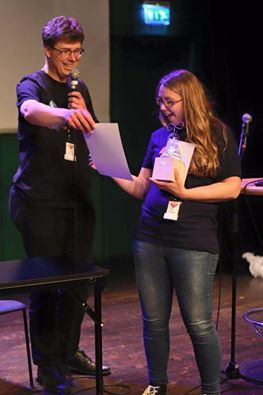 We won the bid, so next Swecon will be named Kontur, and will be in Uppsala the 26th til 28th of May. We're so excited about it! Make sure you come! And then there was the Alvar Prize. I was nominated for the second time, and competed against Håkan Wester, a very nice and pleasant fellow who's done a great job with Västeråsfandom. I had not counted on me winning, but apparently everyone else had. I had thought that I might win, but my utmost concern was wether or not I would cry if I did. I have a tendency to be emotional. It's really embarrassing. I won a phone once at a big convention for my school, and when I got up to receive it I started crying a bit. It was very embarrasing. (This is why I can't ever get married, I would just weep and be a mess.) So I'd tried to steel myself against being too emotional, and I succeeded. Perhaps a bit too well. I was like "OK, let's get this over and done with!" I wish I had prepared a speech and maybe some good pun. Such a wasted opportunity. Anyways, thanks again to all of you whom voted for me. I am so happy to have so many dear friends in fandom, who seem to think that I'm doing something right! Love you all! Caroline mentioned how some fannish stuff like Mushroom in the morning (? )-jokes can be a bit off putting and how much that saddened her. Some in-jokes can be off putting, but rather than stopping with them all together, we must work to le people in on the joke. My immediate thought was that my dillcrisp-joke is becoming like that, and I would love for that to be a thing in Sverifandom. Talking with Caroline and Luke, I got increasingly curious about the British fandom. Lately a lot of British fans have started to come to our cons. This is so nice! 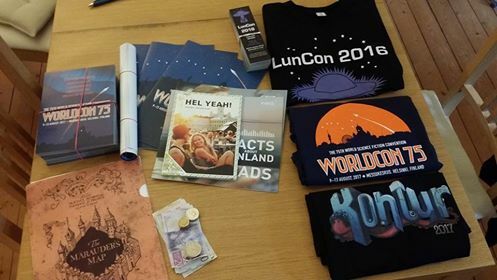 Later me and Nahal found out Nnedi Okorafor is coming to Eastercon in 2018, and so we must go! 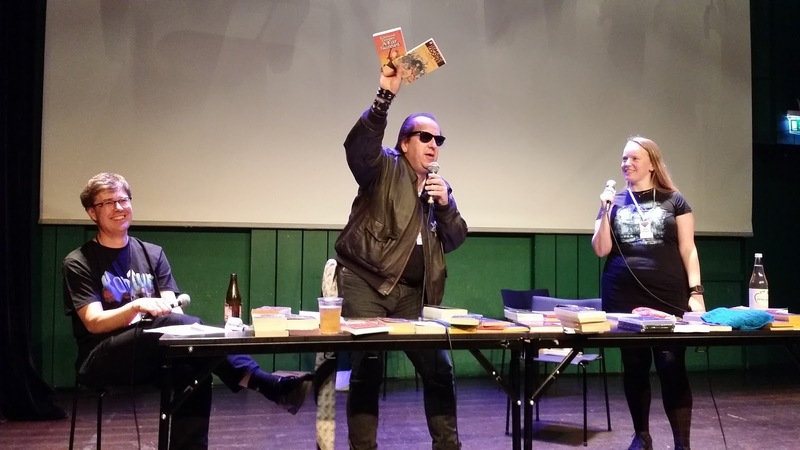 One of the funniest things all weekend was the NoFF auction at Saturday night. The bright and brilliant friend of mine, Hanna Svensson, made up hilariously funny stuff on the go, and the interaction between her, Bellis and Johan Anglemark was lovely. I laughed so hard I cried. 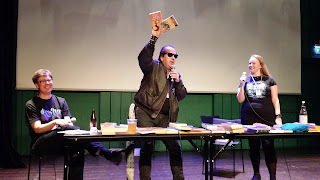 At Saturday's party, the best part was Johan Jönsson reading aloud the Swedish translation of Star Wars 4, with empathy. The second best part was the discussion we had about how Sverifandom would look in 2050. "There will probably be panels discussing how dillcrisp affected Swedish fandom." It's important to make your mark on fandom, and mine is apparently the importance of using microphones, and dillcrisps. 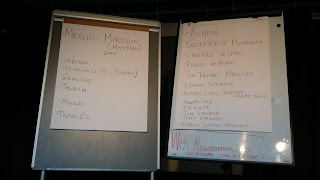 Sunday I got up early to listen to Maria Turtchaninoff's Worldbuilding-talk which was great! I had spent the week reading Anaché and Maresi; fascinating storys with good characterizations, interesting and unique worlds and a fresh take on gender and feminism. 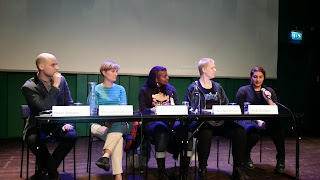 Me and the Onda Cirkeln-members had our tv-series panel which was awesome fun. (Let's do that again, shall we!) Then we went out for lunch with our friends Sara and Marie. Then I just mingled, sold memberships for Kontur, talked to people about Worldcon and fangirled over Gilman. The convention ended on a high note. The choir Gléowine sang songs from LoT and GoT beautifully, and I sat next to the polish fan Marcin, a nice fella'! We enjoyed the closing ceremony tremendously. I had goosebumps. The dead dog party was lovely as ever. I sat outside, mostly, where it was less noisy. Me, Jukka Särkijärvi and Tobias Bodlund plotted a take over of Denmark. 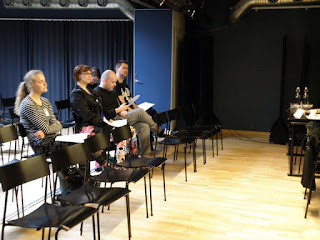 Later in the evening the ideas for Kontur started sprouting, and we decided upon making a game show for Kontur (and I, at least, decided that Jukka Halme must be one of the contestants, schhhh, don't tell him!) and then Tobias got a phone call from his friend Anna whom asked: "Do you want to go swimming, we have a car?" He was somewhat reluctant. Ian Sales added: "Look on the bright side, at least she didn't say 'Do you want to go swimming, we have a cow.'" Tobias stated that he'd go swimming if the car was amphibious, and Ian Sales then added that HE would go swimming if the cow was amphibious. Hilarity ensued. Later in the night we found our way to the hotel lobby where me and Ian Sales showed pictures of our cats (this is the greeting ritual of the crazy cat people). I talked a bit to Markus Olausson too, and Luke was a bit tired. On that note, the tale of the Swecon 2016 must end. We had joy, we had fun, we had seasons in the sun. 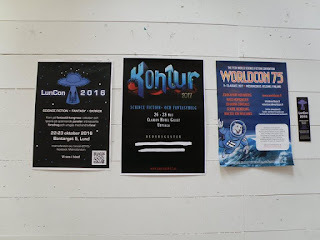 The program I thought was a bit disappointing (probably because I missed everything), the venue was a bit hard on the ears, but the con was well-arranged, the Green room was nice, and Swecon's always the most anticipated time of the year for me, because I get to meet all my friends. 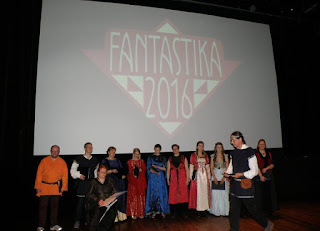 But, there's another story to be told of Fantastika, a parallell story about a very confused hotel staff. Me and Anna Bark Persson booked a hotel room together in January. Being roomies with Anna's always a good plan. I put her to sleep by munching on dillcrisps and she wakes me up early so I don't miss anything of importance. Maria Nygård later joined in May, I contacted the hotel again and booked an extra bed for three nights. The day before the con Anna texted and said she would not be staying the last night because she had to work on monday. Maria would be leaving on Sunday too, so I was going to have the twin room by myself the last night. I remebered that Jukka Särkijärvi had been searching for a place to stay from Sunday til Monday, so now I had a bed to offer, and became the lady in shining tiara and saved the day. I contacted the hotel and asked them to remove the spare bed since it was only the two of us staying the last day. They where confused since I hadn't payed for it (which they never told me to do) but it was easy to fix and I got the spare for two nights, and was going to pay at the desk in the morning. I felt sorry for the hotel staff too, when I once again contacted them about the spare bed, this time cancelling it all together. They were beginning to be rather confused by me ordering and cancelling spare beds at this point. Then on Sunday morning, Linn came and asked if she could leave the bag in my hotel room for the last night, since she was taking an early boat Monday morning. Sure, I said, but where are you going to sleep? I don't have to sleep, she said, I'm going up early. Yeah, I said, I think you should try to sleep for a few hours. *using my motherly voice* Linn said okay. Thus we were three sharing the room the last night. I went back and asked for an extra bed, again, and they said they would put it up there for one night. So now we had three people sharing a room for the last night after all. But when we got up to sleep after the dead dog party, there was no extra bed. I called down and they had to start looking for an extra bed at two in the morning. They finally found one and said "have it for free, since we messed up". Admittedly, I can see how they might have been confused about the whole extra bed situation. And that's how you play Confuse-a-hotel. Yes, the dealer's room was quite hidden (I understand it was supposed to be just by the stairs, but that they had to do a last-minute swap). I didn't suffer from the acoustics (surprise! ), but it's quite possible that Therese did (or would, if she hadn't fallen sick). And that makes us two who missed the Feminac panel, so we can commiserate together. I saw a certain Swedish fan comment on Twitter that a Fandom panel talked too much, but I gathered that was about the International fandom panel, not the fan generation panel. Right now I try to ignore his advice as much as possible. But the programming had some oddities at times (it always has, when you go beyond more than two tracks, and sometimes even at two). And I'm bummed that I missed your silly singing! Ian: Great to meet you too! We'll definitely meet again in the near future! Yes, I know where to finn' you.